The SkinMedica® Vitalize Peel® is what's known as a "light" chemical peel. 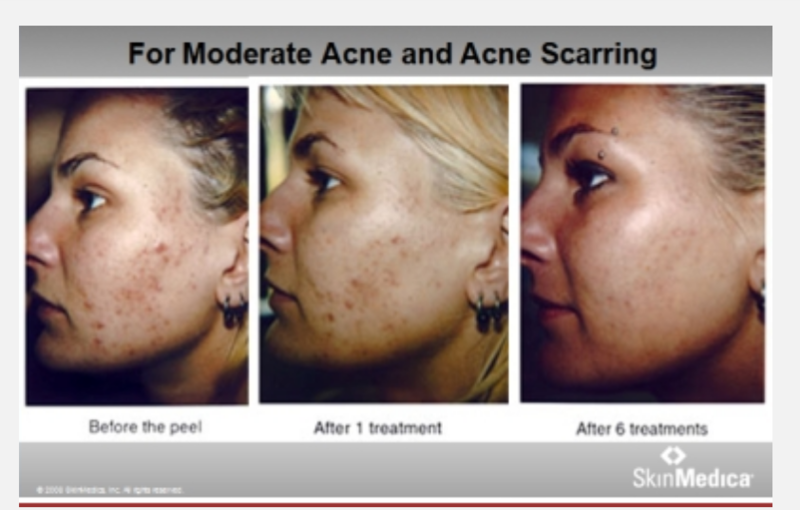 This treatment removes the upper layers of skin, encouraging skin cell regeneration. The downtime is comparatively minimal and the results can be seen after one application, although we recommend at least three for optimal results. The benefits of this product is that you can improve even moderate imperfections, but it's safe for all skin types and for most people. The Vitalize Peel® combines salicylic acid, lactic acid, resorcinol and a retinol solution to improve the look, texture and tone of the skin. This procedure can reduce fine lines and wrinkles, reduce acne scarring, melasma (darkening of the skin sometimes referred to as "pregnancy mask" as it can crop up during pregnancy), freckles and sun damage, and greatly improve the texture of the skin. The peel is applied in three steps. Your appointment will be about 30 minutes. There may be some tingling and discomfort, although most people say it's not painful. There is a recovery period. Most people experience redness, and then of course the peeling, which lasts typically from 5-10 days. For this reason, we highly recommend having treatment at least two weeks before any major events. These peels can safely be done every four weeks until optimal results are achieved. Refresh by Julie sells SkinMedica skin care products as well, which can help maintain skin health.